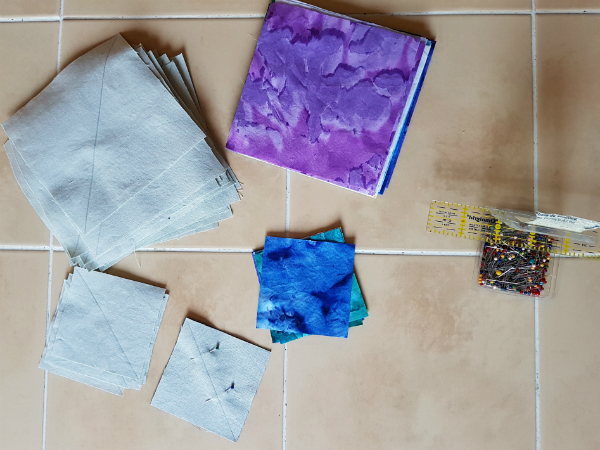 The batiks are destined to be a baby quilt for Paul's nephew's new baby, who arrived on Sunday morning, almost 6 weeks early. I had everything all scheduled out so I could have the quilt made well ahead of her due date, but her early arrival means her quilt will now be late, lol. All is well with baby Riley, though, so I'm not too concerned about a late quilt. 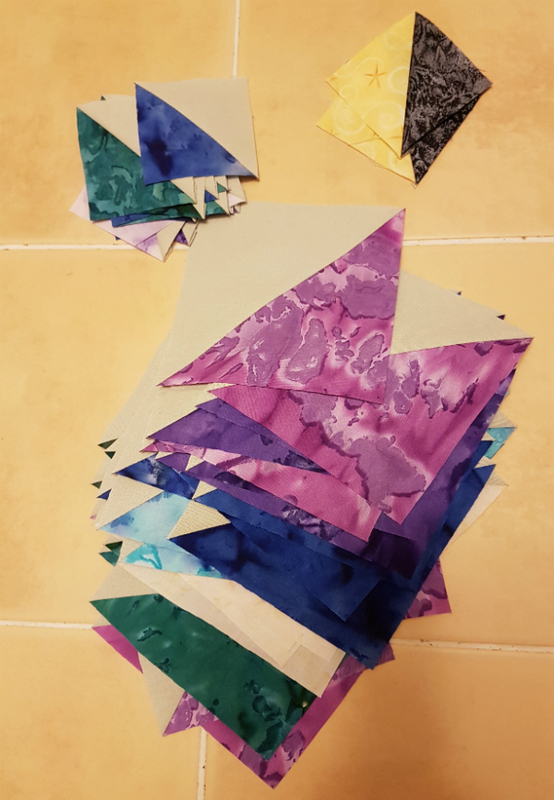 Over the past couple of days, I have cut the batiks and paired them with a solid that seems to be somewhere between grey and green. Sometimes it looks like one, other times the other. I thought I was ordering a light grey, but thankfully this greenish grey works too. That's the trouble with ordering through a computer screen, I guess. Have you ever had that problem when ordering fabrics online? 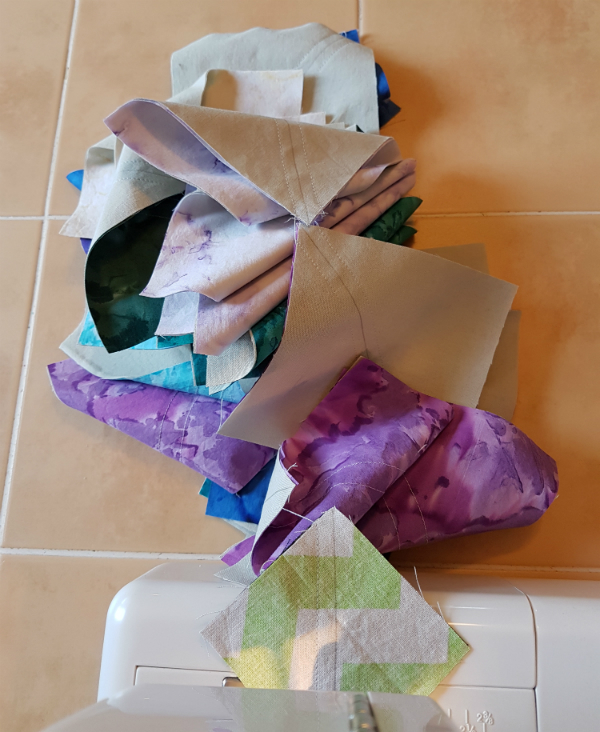 Chain piecing is so pretty! I trim my HSTs before pressing them open. 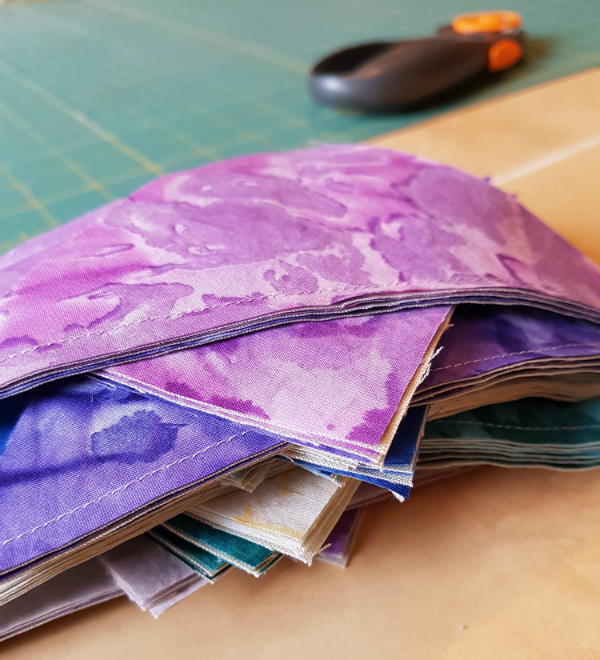 I line up the seam on the 45° line on my cutting mat and then trim on the lines that match the unfinished size I want the HST to be. I should have taken a picture, but I didn't think of that. All trimmed and ready to go 😊 If you're thinking two of these things don't look like the others, that's because I'm making leader/ender HSTs as I piece the baby quilt. That's what I'm up to these days 😊 What are you working on? And what beautiful colours are you using? I love that pink/purple batik! I use the kona cotton color card to make sure I am getting the correct color of solid. I love kona cotton! That is a real riot of colour you have going on there Leanne, it will be a gorgeous baby quilt. 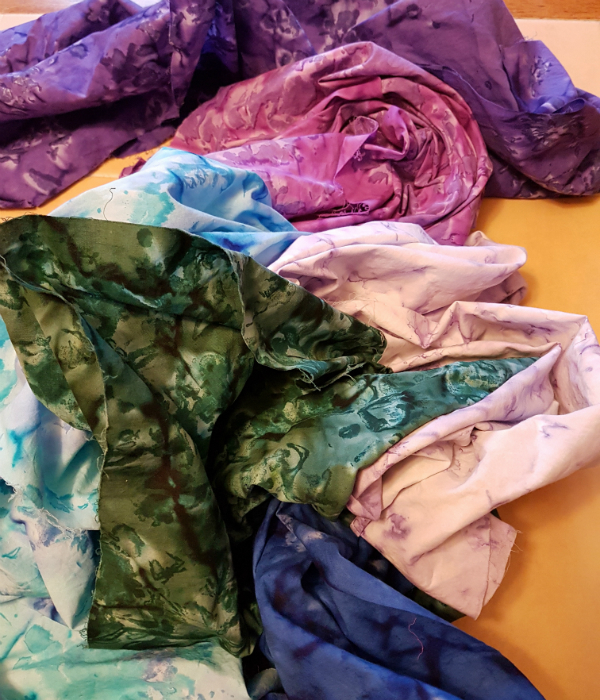 I recently used Plush Addict's colour matching service for the first time as I wasn't sure which Kona Solid was the right match for some fabric I was ordering. It worked a treat as they substituted my ordered solid for a slightly different one which was a perfect match. I will definitely do this again in the future. I love batiks, partly because they don't fray, always a bonus. I only started ordering mainly online this last year for the exact same reason you mention, the colours are not always the same. Like Shannon I have Kona colour card now but that only helps me buying Kona solids. I still buy from my local quilt shop though, if we don't use them we loose them. Congratulations to your family for the safe arrival of baby Riley. Love the colours. I used to trim my HST's before pressing them open, but I now use a Bloc Loc ruler. Glad to hear Riley is okay. She won't know the quilt is late. LOL I haven't made one yet for my new niece. Inspiration hasn't hit yet. Hopefully in time for Christmas.